CBI - China: Day 78 of 154 of the Japanese Invasion of Manchuria. Spain: Day 141 of 985 of the Spanish Civil War. Spain: Day 506 of 985 of the Spanish Civil War. CBI - China: Day 151 of 2,987 of the 2nd Sino-Japanese War. Spain: Day 871 of 985 of the Spanish Civil War. CBI - China: Day 516 of 2,987 of the 2nd Sino-Japanese War. Day 54 of 81 of Japan's Operation GUANGDONG. Atlantic: The German pocket battleship ADMIRAL GRAF SPEE sinks the liner DORIC STAR off the western coast of South Africa. Finland: Day 5 of 105 of the Russo-Finnish War. CBI - China: Day 881 of 2,987 of the 2nd Sino-Japanese War. Day 20 of 381 of the Battle of South Guangxi. ETO - UK: Day 90 of 258 of the Blitz. MTO - Albania: The Greeks capture Premeti, Pogradec and the port of Sarande. East Africa: Day 178 of 537 of Italy's East African campaign in the lands south of Egypt. CBI - China: Day 1,247 of 2,987 of the 2nd Sino-Japanese War. CBI - Thailand: Day 65 of 221 of the Franco-Thai War (Vichy France vs Thailand). USA: The Japanese Embassy in Washington begins to leave, destroying code books and personal files in the process. 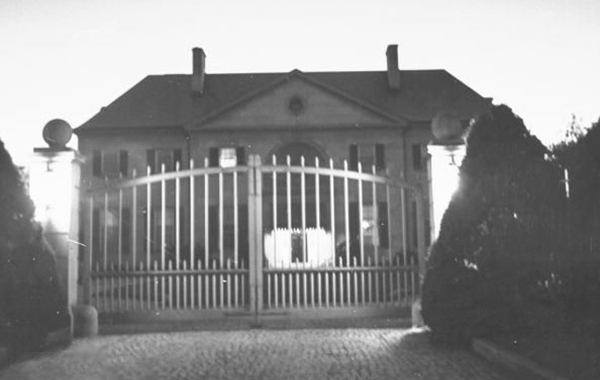 After the attack on Pearl Harbor and Japan's declaration of war, Spain as a neutral nation served as a custodian for the embassy building until 1945 when the Swiss took over. After the war, the US government briefly occupied the building and then returned it to Japan when diplomatic relations were restored in 1952. Many of the non-essential Japanese Embassy staff who remained behind were interned at Hot Springs, Virginia, until June of 1942, when they were exchanged for American diplomatic personnel trapped in similar circumstances in Tokyo when hostilities broke out. Russian Front: Day 166 of 167 of Germany's Operation BARBAROSSA. Temperature falls to -31°F (-37°C) on the Russian Front. Russian Front - North: Day 88 of 872 of the Siege of Leningrad. Russian Front - Center: Day 64 of 98 of the Battle of Moscow. Russian Front - South: Day 36 of 248 of the Siege of Sevastopol, Crimean Peninsula. MTO - Libya: Day 239 of 256 of the Siege of Tobruk. New Zealand troops repulse a German attack on El Duda. Meanwhile, Indian forces face attrition in an uphill attempt to capture Point 174 against entrenched Italian forces without artillery support. CBI - China: Day 1,612 of 2,987 of the 2nd Sino-Japanese War. Russian Front - North: Day 453 of 872 of the Siege of Leningrad. Russian Front - North: Day 16 of 59 of the Battle of Velikiye Luki, near Leningrad. This stalemate does help ease the siege a little, but mostly it keeps German troops from being sent to other fronts. Russian Front - North: Day 214 of 658 of the Siege of the Kholm Pocket, USSR lays siege to the Kholm Pocket but the Germans hold out for a about a year and a half. Russian Front - Center: Day 11 of 21 of the Battle of Sychevka, Russia. Russian Front - Center: Day 10 of 26 of the 2nd Battle of Rzhev-Sychevka, Russia, launched by the Soviets as Operation MARS. Russian Front - Center: Day 10 of 22 of the Battle of Belyi, Russia. Russian Front - Center: Day 10 of 17 of the Battle of Luchesa (Vitebsk), Russia. Russian Front - Center: Day 10 of 29 of the Battle of Molodoi Tud River, Russia. Russian Front - South: Day 105 of 165 of the Battle of Stalingrad, bloodiest battle in human history. MTO - Tunisia: Day 18 of 178 of the Battle of Tunisia. German troops secure Tebourba. US 12th Air Force provides air support attacking shipping and docks at Bizerte. MTO - Italy: US 9th Air Force launches its first attack on Italy sending its B-24s to attack the harbor at Naples. CBI - China: Day 1,977 of 2,987 of the 2nd Sino-Japanese War. PTO - Alaska: Day 181 of 435 of the Battle of Kiska, Aleutian Islands. PTO - Malaya: Day 289 of 357 of the Battle of Timor Island, a long guerrilla war ending in Japanese victory. PTO - New Guinea: Day 16 of 66 of the Battle of Buna-Gona. PTO - Solomon Islands: Day 120 of 187 of the Battle of Guadalcanal. ETO - Germany: Day 17 of 135 of the Battle of Berlin (RAF bombing campaign). Duisburg is attacked by nine Mosquitos. Russian Front - North: Day 818 of 872 of the Siege of Leningrad. Russian Front - North: Day 579 of 658 of the Siege of the Kholm Pocket. USSR lays siege to the Kholm Pocket but the Germans hold out for a about a year and a half. Russian Front - South: Day 103 of 122 of the Battle of the Lower Dnieper River, USSR. The German 11th Army begins an offensive to eliminate the Soviet bridgehead at Kerch in the eastern Crimea. MTO - Yugoslavia: Tito's Partisans set up a provisional government in the liberated part of Yugoslavia. MTO - Egypt: Second Cairo Conference begins with Roosevelt, Churchill, and Ismet Inonu of Turkey attending. CBI - China: Day 2,342 of 2,987 of the 2nd Sino-Japanese War. Day 33 of 49 of the Battle of West Changde. PTO - New Guinea: Day 77 of 219 of the Battle of Shaggy Ridge. PTO - New Guinea: Day 74 of 162 of the Battle of the Huon Peninsula. PTO - Solomon Islands: Day 34 of 295 of the Battle of the Bougainville Islands. ETO - France: Day 126 of 284 of the Battle of Brittany. ETO - France: Day 81 of 236 of the Siege of Dunkirk. ETO - Germany: Day 77 of 145 of the Battle of Hürtgen Forest. ETO - Germany: US 8th Air Force heavy bombers attack logistical targets in Germany. Russian Front - Finland: Day 81 of 223 of the Lapland War. Finland and Russia have joined forces to kick the Germans out of Finland's most northern province. Russian Front - Center: Day 51 of 206 of the Battle of the Courland Pocket in Latvia. Russian Front - Center: Day 44 of 99 of the Siege of Memel, a border town of Lithuania and East Prussia. Russian Front - South: Day 37 of 108 of the Battle of Budapest, Hungary. MTO - Greece: Civil War breaks out and Athens is placed under martial law. MTO - Yugoslavia: US 15th Air Force: P-38s bomb a railroad bridge at Zenica. CBI - Burma: Day 248 of 302 of the Chinese Salween Offensive. CBI - Burma: Day 21 of 31 of the Battle of Bhamo. CBI - China: Day 2,708 of 2,987 of the 2nd Sino-Japanese War. Day 232 of 259 of Japan's Operation ICHI-GO. PTO - New Guinea: Day 343 of 597 of the Battle of New Britain. PTO - New Guinea: Day 227 of 481 of the Battle of Western New Guinea. PTO - Philippines: Day 46 of 299 of the 2nd Battle of the Philippines, aka the Liberation of the Philippines or the Philippines Campaign. PTO - Philippines: Day 46 of 73 of the Battle of Leyte. PTO - Philippines: Day 24 of 41 of the Naval Battle of Ormoc Bay. Lt Georgiana Taylor's cozy life as a flight nurse gets decidedly more complicated when she meets someone in Sicily.